Calcium is a mineral that is crucial for the development and maintenance of good, strong, healthy bones and teeth. Calcium is particularly critical for children, since their bones are developing and forming. The stronger a child’s bones are when they are developing, the stronger they will remain throughout life. Calcium continues to be critical throughout life, however, not only to fix and repair bones, but to retain good bone density. While you can certainly take calcium supplements, your body can only absorb so much calcium from them. Supplements should be just that – something taken to simply supplement the vitamins and minerals you are getting from fresh food sources. 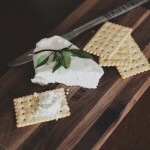 While most dairy products are rich in calcium, some people can be allergic to dairy or have a sensitivity to lactose – an enzyme generally found in abundance in most dairy products. The good news is, however, there are a number of different foods besides dairy products that are also high in calcium. Here are 17 non-dairy foods that also contain calcium. While they are not exactly calcium rich, sunflower seeds do contain 20 mg of calcium per 1 oz. serving, or roughly 2% of the recommended daily allowance of calcium. While that may not seem like a lot – and it isn’t – every little bit helps, and sunflower seeds are an incredibly easy – and tasty – way to get a bit of extra calcium in your diet. You can sprinkle them on salads, bake them into muffins, or just keep a package of them at your desk for easy snacking. Just a single cup of green beans contains 37 mg of calcium, which just under 4% of the RDA of calcium. 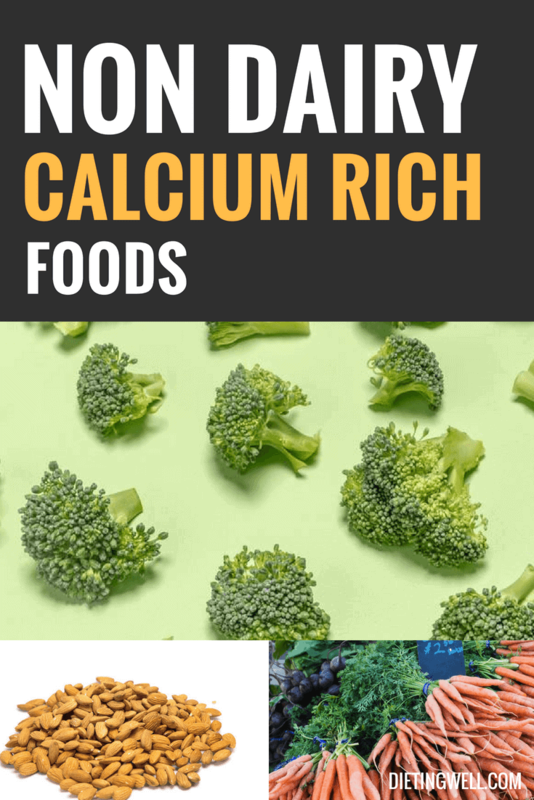 While they may not contain an overwhelming abundance of calcium, what they also contain is a whopping 15% of the recommended daily allowance of Vitamin K. Vitamin K is most well known for helping your blood to coagulate. In fact, it was named for the German word for this: “koagulation.” In addition, while there is not yet clear evidence of this, research is underway to determine if there is a link between Vitamin K and good bone health. Even if Vitamin K doesn’t actually make your bones more healthy, it certainly has enough other benefits to make it worth stocking up on. One cup of chopped carrots contains 42mg of Calcium, or about 45% of the RDA. In addition, however, carrots also offer a whopping 400% of the recommended daily allowance of Vitamin A. Vitamin A is crucial for good vision and a healthy immune system. Carrots also contain beta-carotene, which is where they get their orange color. Beta-carotene was actually named for the carrots in which it was first discovered and is another element that promotes good vision. It turns out in this case, all the “old wive’s tales” are actually true – carrots are not only great for your bones, they are great for your vision. While Fig Newtons may be the tastiest and easiest way to eat figs, you won’t reap the nutritional benefits that way. 3 medium figs contain 52 mg of calcium, which is roughly 5% of the RDA. You can sprinkle fresh figs on salads, pop them in smoothies or even eat them plain. Dried figs also make a great tasty treat for on-the-go. While broccoli packs a healthy 62 mg of calcium per 1 cup serving, these tiny little trees also pack a walloping punch of other vitamins, minerals and nutrients, including 135% of the RDA of Vitamin C and 118% of the all-important Vitamin K. If you need even more reason to pack some leafy little trees into your diet, however, broccoli also contains a compound that is thought to essentially “switch off” cancer genes on a genetic level. One study of men that ate at least a half a cup of broccoli three times a week showed a remarkable 41% decrease in the risk of prostate cancer. In addition to being deliciously tasty, these orange root vegetables are also rich in potassium and Vitamins A and C. These delicious vegetables can be made into pies, fries, bread, soup or even as a favorite dish at Thanksgiving. Almost any recipe you can use potatoes for, you can swap out for this much more colorful cousin. While oranges are most well-known for their surplus of Vitamin C, a single orange will also provide you with roughly 7% of your daily allowance of Calcium. Oranges are one of the easiest fruits to add to your diet as they are handy, portable, delicious and even come in their own container! Next time you need a convenient snack to take with you, reach for an orange instead of a granola bar or some other type of prepackaged snack. Almonds are most well known for being a convenient source of protein for on-the-go, but 1 ounce of almonds also contains 76 mg of calcium, which is almost 10% of the recommended daily allowance. Not only are they a great source of protein, but they are also packed with fiber, which can help you lose weight, and monounsaturated fat that can help reduce levels of bad cholesterol. Butternut squash is most well-known for being the main ingredient in a tasty soup, but it’s also delicious all on its own. Much like the sweet potato, butternut squash is an incredibly versatile food that can actually be used in a wide variety of recipes, including a delicious lasagne. Not only does it provide almost 10% of the recommended daily allowance of calcium, but is also rich in potassium and an abundance of Vitamin A. Butternut squash also gets its vibrant color from the same Beta-Carotene that carrots do, which means it’s just as good for your vision as well. Rockfish is a common name for a number of different types of fish which are all notable for their tendency to hide among rocks. Some of the more notable or well-known species of this type of fish are Grouper, Striped Bass and a member of the salmon family sometimes referred to as Char. Perhaps one of the best perks of rockfish is that they are generally exposed to very little mercury, which makes them a healthy alternative to many deep-water fish. While just a 3 oz. serving of this tasty and delicious fish will provide 116 mg of calcium, be aware that they are not as high in the Omega-3 fatty acids that fattier fish like salmon and mackerel are. If you’re looking for a fish that is high in both however, look no further than arctic char, which also contains 6 grams of Omega-3’s. Kelp is a type of seaweed and is often found in a variety of Asian foods. Not only is kelp rich in calcium, containing 134 mg per cup, but it’s also great for weight loss and can even help combat hair loss. Perhaps the biggest benefit of kelp however, is its supercharged iodine content. Iodine is a critical element in producing thyroid hormones, which can help promote good hormonal balance. Lowered levels of iodine can contribute to a number of different diseases and disorders including polycystic ovarian disease, hypo and hyperactive thyroid conditions, autoimmune diseases, and even diabetes. Just a single teaspoon of these tiny little seeds provides 140 mg or nearly 15% of the recommended daily allowance of calcium. Because of how tiny sesame seeds are, they can be sprinkled inconspicuously on a wide variety of foods to pack some extra calcium into almost any meal or snack. Not only are they high in calcium, but they can also help protect against radiation and may even help eliminate depression and chronic stress. Much of the nutritional benefit of sesame seeds comes from the oil, which is found in higher concentration in sesame seeds than in any other oil producing crop in the world. While sesame seeds are the best source of calcium, sesame oil also contains a number of the same health properties that the seeds do. In addition to being rich in protein, fiber and potassium, a single serving of white beans also provides more than 15% of the recommended allowance of calcium. Perhaps best of all, however, white beans are one of a new variety of foods known as “resistant starches.” This means that it’s a carbohydrate that actually resists being broken down in the gut. This allows it to pass through the small intestine without being digested, which leads to a prolonged feeling of fulness and promotes the formation of good bacteria in the gut. Resistant starches are particularly important for diabetes sufferers, as they are particularly effective at helping balance blood sugars. More than just the name of a popular band, black eyed peas are actually a member of the bean family. While black eyed peas are generally a buff color with a dark brown or black “eye,” some varieties may actually have a red, pink or green eye. Like their namesake, black eyed peas actually grow in a pod, just like a regular pea. When freshly shelled, all black eyed peas are green, but turn the traditional buff color when dried. Another variation of the black eyed pea is the purple hull pea. This pea is usually green with a purple or pink eye. One half cup of black eyed peas contains nearly 20% of the recommended allowance of calcium. The South in particular is well known for collard greens being a basic staple of Southern cuisine. An interesting fact about greens is that they have one nutritional profile when eaten raw and entirely different nutritional profile when cooked. In order to unlock the calcium content of collard, kale, turnip or mustard greens, you need to cook them. While sautéing them isn’t the only way to unlock the calcium content of greens, it is certainly one of the more tasty ways of doing it. A single cup of cooked greens contains somewhere between 94-179 mg for kale, turnip or mustard greens, depending on the type. For the most calcium-rich greens, however, you can’t go wrong with collard greens as they contain a whopping 266 mg per cup, which is almost 25% of the recommended allowance. Edamame are young soybeans, which are still in the pod. Because they are not yet mature, they are still tender, soft and edible, unlike mature soybeans which become hard and dry. As a result, mature soybeans are usually used to make soy milk, ground into powder or made into tofu. Edamame, however, has all of the same nutrients as it’s more mature counterpart, including being packed with protein. If you’ve ever eaten at a sushi restaurant, you have probably snacked on this green delicacy before enjoying your meal, and if you haven’t – you’re missing out. One cup of edamame contains about 98 mg of calcium. Tofu is sometimes known as bean curd, because it is made with soybeans, water and some kind of coagulant or curdling agent. Tofu is essentially curdled soy, but has a delicious subtle flavor and can be used in a wide variety of dishes. Because of the high protein content, many vegans and vegetarians use it as a meat substitute. Tofu can be BBQ’d fried, scrambled or even used in a number of casseroles and other dishes that traditionally call for meat. Depending on how tofu is seasoned, you may never even know you aren’t eating meat. Half a cup of tofu provides 227 grams of calcium, or close to 25% of the RDA. By far the grandaddy of all calcium rich foods, just a single 3 oz serving of canned sardines contain a whopping 325 mg of calcium or nearly 33% of the RDA. If you’re looking for calcium content in sardines, however, you want to be sure and find the kind that contain bones. The bones are actually soft and edible, so you don’t have to worry about choking on them. As strange as it may seem to eat fish with the bones still intact, it’s a requirement for sardines, since the bones are where all the calcium comes from. While sardines are not for everyone, for those that can actually stomach both the bones and the strong fishy taste, sardines are by far the very best non-dairy source of calcium. Whether you eschew dairy for humanitarian reasons, are lactose intolerant or just plain don’t like most dairy products, there is still no reason you can’t get a sufficient amount of calcium in your diet from whole food sources. While you certainly need to get the majority of the calcium in your diet from food and plant sources, it also never hurts to get a little extra from supplements. Be sure, however, that when choosing a supplement, you also choose one that has the necessary supporting vitamins and minerals that will help your body actually absorb the calcium. After all, calcium doesn’t do you any good if your body can’t absorb it.